Bill Jacobs BMW is pleased to announce the success of their toy collection for local Ronald McDonald House Charities of Chicagoland. We were so pleased at the generosity of our guests from Thursday night’s Holiday Event. The toys just kept coming in, and we are proud to know they will be going to local kids at Chicagoland hospitals to make their holidays a little brighter. Bill Jacobs BMW is pleased to announce the success of their toy collection for local Ronald McDonald House Charities of Chicagoland. Last week, the Ronald McDonald House truck stopped in at the dealership to load up over 20 large bags of brand new toys, dolls, games, and Legos--just to name few! The gifts collected were graciously donated by the attendees of the Bill Jacobs BMW Holiday Event that took place on December 5th. Guests who brought a new toy for the children in recovery at local Chicagoland hospitals received a raffle ticket for a chance to win one of three fantastic experiences as a prize. The first package included a pair of 100-level tickets to see the Chicago Blackhawks at the United Center, with parking passes. The second package included an $800 in-home catered dinner for 6 guests, by a local Chef Alia Dalal. The third package included Orchestra tickets for four at Broadway in Chicago with a $200 gift certificate for dinner downtown at the Atwood Café. “We were so pleased at the generosity of our guests from Thursday night’s Holiday Event. The toys just kept coming in, and we are proud to know they will be going to local kids at Chicagoland hospitals to make their holidays a little brighter,” said Greg Joutras, General Manager at Bill Jacobs BMW. 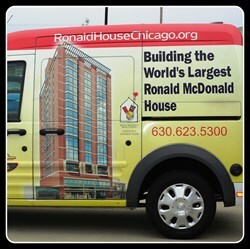 The Ronald McDonald House Charities of Chicagoland has four current Houses that provide a ‘home away from home’ to keep families together. Located near Advocate Children’s Hospital, Loyola University Medical Center, University of Chicago Comer Children’s Hospital, and the new Ann & Robert H. Lurie Children’s Hospital of Chicago, the Houses allow families to eat, sleep and find the emotional support they need - just blocks from where their child is being treated. This year they provided over 30,000 nights to families, offering them care and comfort during their hours of greatest need. While they suggest a donation of $10 per night, no family is ever turned away if they are unable to pay.